My dad was a big man. That’s why, in high school, the football coach told him to try out for the team. W.A. (Weyman Alexander) loved the game. He earned a scholarship to play football at an engineering college where he was taught to print in sturdy, even capital letters. However, he was a liberal arts soul who earned a technical degree. He’s not the only person this has happened to and it wasn’t a bad thing. He was a first-string player and, after graduation, his career took him from teaching to insurance sales to the financial industry. One morning, I needed a note because I was late for school. He took a pen out of his pocket and wrote my note in beautiful, black flowing cursive. I was so surprised! I was accustomed to his printing and had forgotten he could write in cursive too. Plus, I had never seen this pen. When I asked about it, he said, “Oh, it’s just a little something I bought for myself.” It would have been in character for him to let me try his pen, but I have no memory of writing with it. What I do remember is how the pen looked in his hand. I didn’t know it then, but his pen was a Montblanc. Fast forward about ten years. My mother, Norma, and I were in Munich, Germany. W.A. had died. Norma had gone back to school, gotten a job and was dating Ted. During the trip, she had been looking for a gift to take to him. On our last day, we wandered into a store that sold Montblanc pens. At the time, I could converse with the salesperson in German about the pens and explain the differences to Norma. Ted became the happy recipient of a Montblanc. Fast forward. Norma gave me money for my birthday. I purchased a turquoise Lamy Safari and ink cartridges and began practicing purple cursive. “Yes. It’s in my desk,” she said. I brought it home, and thanks to The Goulet Pen Company’s YouTube videos, I flushed it and filled it with Pelikan 4001 Turquoise ink. The piston in Ted’s Montblanc was stuck and I was having ink flow problems with W.A.’s pen. Fortunately, there is a Mont Blanc store in town. I took my pens there and found out several things: I possess two, vintage Montblanc Meisterstück (Masterpiece) pens, it’s best to use Mont Blanc ink and Ted’s pen required a necessary but easy repair. After I got Ted’s pen back, I ordered a fountain pen stand for my desk. 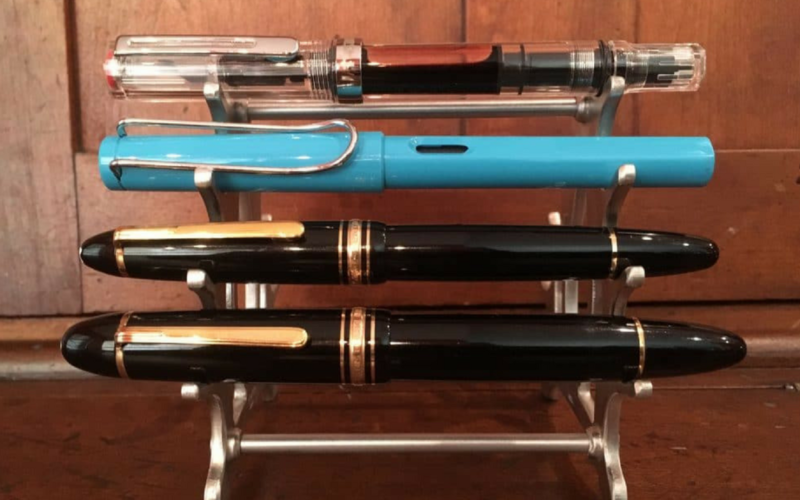 The care, maintenance and use of fountain pens is a fascinating learning curve. I write with mine every day. This means I literally hold memories in my hands: of two different but wonderful fathers and of my lovely, fiercely independent mother. Since Norma’s death, I bought a clear TWSBI Eco fountain pen so I could enjoy seeing the golden brown color of J. Herbin Caroube de Chyrpe 1670 Anniversary ink. My Lamy still writes purple, Ted’s writes Mont Blanc Corn Poppy Red and W.A.’s writes Mont Blanc Royal Blue. I smiled and pointed to my fountain pen stand; it holds eight. Four more to go. I wonder what memories they will bring into my hands?